A couple years ago, URR posted this introduction to the Marine Corps combat use of the rifled 120mm mortar Expeditionary Fire Support System. 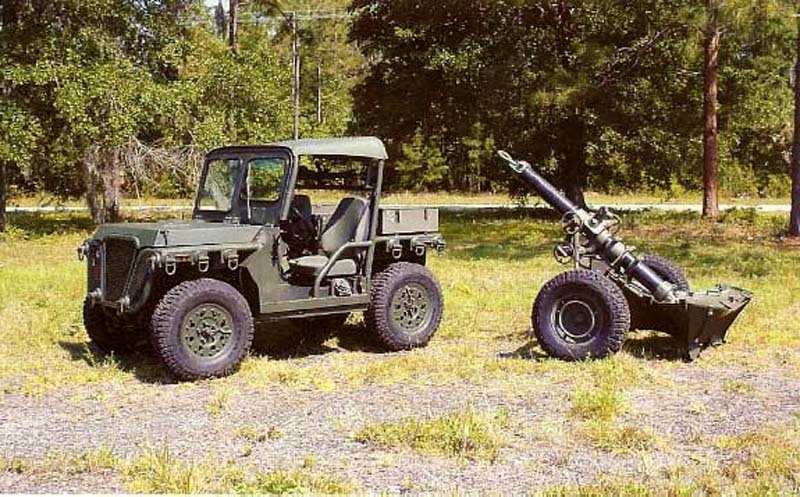 It’s light weight (relative to other fire support options) has led to its adoption as the primary direct support indirect fire weapon in Marine artillery regiments. One major potential shortcoming of the EFSS is its short maximum range of about 8500 meters. Given that shortcoming, the Marines began the development of PERM, or the Precision Extended Range Munition. Not only does the use of a guided munition increase the first round accuracy of a shot, the fins allow the trajectory to be shaped to dramatically alter the path of the round, greatly extending the range, to a quite respectable 17,000 meters or so. Last month, Raytheon, the developer, fired four PERMs in successful tests. An additional 42 rounds of test firing are due this year. If successful, the PERM should begin to show up on the caissons of the EFSS shortly thereafter. The Army is fast tracking a GPS guided 120mm mortar round to Afghanistan in response to an urgent request for precision mortar fire from commanders on the ground there, and should be fielded by the end of the year. Called the Accelerated Precision Mortar Initiative (APMI), it improves upon the current round’s 136-meter Circular Error Probable (CEP) reducing it to about 10-meters. That’s good news for grunts on the ground. The 120mm mortar is the battalion commander’s “hip pocket” artillery, and it packs a good punch. The problem has always been that mortars are not terribly accurate. Their high angle of fire and their low velocity leaves them vulnerable to wind drift, among other things. This, of course, addresses that. There’s another consideration. Most of the time, if the first mortar round doesn’t drop right on the enemy’s head, he’s got some time to seek cover. Now, he’s liable to be caught in the open with the first round, which greatly increases the chances of killing them. Many of you have an account with Flickr, the image hosting site owned by Yahoo! Somehow, I don’t think they planned it to go this way…. By the way, kids- Don’t try this at home. Author XBradTC2Posted on May 28, 2009 Categories 120mm, armor, army, ARMY TRAINING, guns, iraqTags 120mm, armor, army, army life, ARMY TRAINING, iraq, m-1, stupid, tank, tanks, war4 Comments on Whoa! I don’t know why I spent all that time typing about HEAT rounds and sabots when National Geo covered pretty much all the high points in just over two minutes. We’ve seen a similar video before, and couldn’t resist stealing this one from the Armorer over at The Castle. There is, not surprisingly, a good deal of NSFW language, so you might turn down the volume, or wait till you get home to watch. What we see is a mortar team firing their 120mm mortar at Anti-Coalition Forces that are (presumably) attacking their Combat Outpost. Since the idea is to suppress the incoming fire, they are laying down both High Explosive and White Phosphorus rounds on the enemy. The HE of course blows up real good, and while the WP may cause casualties, the primary effect is the dense white smoke makes it hard for the enemy to aim their weapons. Note the professionalism of the crew. Just as soon as the fight is over, they start clearing up the pit, counting their ammo, cleaning their tube, and generally getting everything set for another round. Impressive. How ’bout a little tanker pr0n? Author XBradTC2Posted on February 4, 2009 Categories 120mm, armor, army, ARMY TRAINING, gunsTags 120mm, armor, army, ARMY TRAINING, guns, heat, m-1, tank, tanks, war4 Comments on How ’bout a little tanker pr0n?